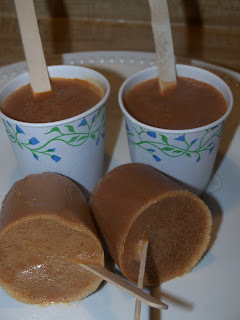 I love Chai and wanted to make a Chai Popsicle and I really didn't see that many recipes online for this one. So I thought about it and came up with this recipe. Bring the tea bags and milk to boiling, let simmer for about 3-4 minutes. Cool. Add milk to tea mixture to bring the measurement back to 3/4 cup if needed. Discard tea bags. Blend all ingredients together until smooth. Fill molds and freeze for about 6 hours. I got 4 small popsicles out of this recipe.